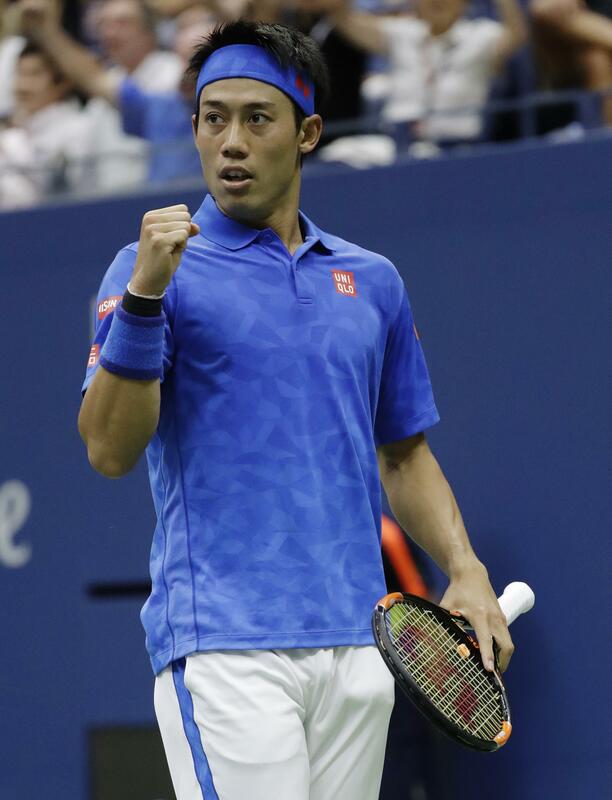 Tennis: Andy Murray dropped seven consecutive games after a let call caused by a loud noise in the arena’s speaker system during a fourth-set point and lost to Kei Nishikori 1-6, 6-4, 4-6, 6-1, 7-5 in a riveting U.S. Open quarterfinal Wednesday in New York. Murray, the No. 2 seed and 2012 champion at Flushing Meadows, disagreed with chair umpire Marija Cicak’s decision to immediately halt things when play was interrupted by a sound similar to what a gong might make. It happened with Murray already up two sets to one and holding a second break point at 1-all in the fourth. Murray complained about the ruling right away and gave away the next three points to lose the game, then brought it up again with Cicak at the ensuing changeover, saying something similar had happened earlier without a re-do of the point. Murray wound up losing 12 of 14 points right after the let call and seven games in a row to drop that set 6-1 and trail 2-0 in the fifth. That same type of noise came from the Arthur Ashe Stadium speakers again at 4-1 in the fourth set. It also had happened during a women’s match Monday night between Ana Konjuh and Agnieszka Radwanska. The U.S. Tennis Association said Wednesday that a “digital audio sound processor” was at fault and would be replaced before the night session. Williams moves to semis: Serena Williams’ serve was broken for the first time at this year’s U.S. Open, but she righted herself in the third set to emerge with a 6-2, 4-6, 6-3 victory over Simona Halep to get back to the semifinals at Flushing Meadows. NFL: NFL Commissioner Roger Goodell disagrees with Colin Kaepernick’s choice to kneel during the national anthem, but recognizes the quarterback’s right to protest. Brees signs new contract: Saints quarterback Drew Brees agreed to new contract that keeps him in New Orleans through the 2017 season, and a person familiar with the deal says it guarantees the record-setting QB $44.3 million the next two years. The deal also provides the Saints with nearly $13 million in additional spending flexibility under the 2016 salary cap as the team continues to shuffle the roster in advance of Sunday’s regular season opener at home against Oakland. Sanders, Broncos sign extension: Emmanuel Sanders and the Denver Broncos agreed on a three-year, $33 million contract extension on the eve of the season opener. With the deal, which runs through 2019, general manager John Elway checked off the final box on his offseason to-do list, which included finding Peyton Manning’s successor (Trevor Siemian) and signing a trio of stars to long-term deals: linebackers Von Miller and Brandon Marshall and Sanders. He’ll make $5.6 million this season in the final year of the three-year, $15 million contract he signed with Denver in 2014 when the Broncos lured him away from the Kansas City Chiefs’ complex just as he was about to sign with their AFC West rivals. Henderson appeals suspension: Bills offensive tackle Seantrel Henderson is appealing the NFL’s four-game suspension for violating the league’s substance abuse policy after testing positive for marijuana. A person with knowledge of the situation said Henderson’s appeal is based on him using marijuana for medicinal purposes to relieve the effects of Crohn’s disease. Henderson was diagnosed with the inflammatory bowel disease late last year. Women’s basketball: Jewell Loyd scored 25 points and Breanna Stewart added 23 to help the Seattle Storm beat the host New York Liberty 102-78. Crystal Langhorne had 21 points for the Storm (13-17), who moved into a tie for seventh place in the playoff chase. Seattle has four games left in the regular season. Even with the loss the Liberty secured the third seed in the WNBA playoffs with Chicago’s loss to Washington. New York has a first round bye and will play the lowest remaining seed in the second round. With the game tied at 48 early in the third quarter, Seattle went on a 13-3 run to take control of the game. Stewart got the burst started and Sue Bird capped it with a 3-pointer that made it 61-51. New York (21-9) couldn’t get within eight the rest of the way. Tina Charles led the Liberty with 22 points, nine rebounds and seven assists, and Sugar Rodgers added 15 points. New York was still without Tanisha Wright (knee), Kiah Stokes (hip) and Shoni Schimmel (concussion). Seattle ended an eight-game losing streak against the Liberty. New York honored Swin Cash in a postgame ceremony. The 15-year veteran announced in June that she would retire at the end of the season. Speakers included WNBA President Lisa Borders, Tina Thompson, Bird and Isiah Thomas. Billings to host NAIA Division I tourney: The tourism arm of the city of Billings and Rocky Mountain College are hosting the next two NAIA Division I women’s basketball tournaments, the first time the tournament has been held in the western United States. The tournaments will take place March 15-21, 2017, and March 14-20, 2018, at Rimrock Auto Arena at MetraPark. MLB: Astros shortstop Carlos Correa has been sent back to Houston because of inflammation in his left shoulder. Manager A.J. Hinch said he was optimistic the reigning A.L. Rookie of Year would be able to play this weekend when the Astros host the Chicago Cubs. Hinch said the team wanted Correa to undergo additional medical tests. Correa experienced soreness in his shoulder in Tuesday night’s game against Cleveland and told Hinch he was uncomfortable upon waking Wednesday. He struck out in his three at-bats before singling in the eighth inning Tuesday. Nats activate Strasburg: The N.L. East-leading Washington Nationals reinstated ace Stephen Strasburg (elbow) from the disabled list for him to start Wednesday night against the Atlanta Braves. Strasburg (15-4, 3.59 ERA) has not pitched since Aug. 17 because of right elbow soreness. Miscellany: Megan Rapinoe was stymied in a bid for a second national anthem protest when Washington’s National Women’s Soccer League team moved up the pregame ceremonies. “We decided to play the anthem in our stadium ahead of schedule rather than subject our fans and friends to the disrespect we feel such an act would represent,” the Spirit said in a statement. On Sunday before the Seattle Rhein’s game in Chicago, Rapinoe knelt during the national anthem “in a little nod” to NFL quarterback Colin Kaepernick. Barcelona looks to expand U.S. market: Looking to capitalize on its biggest assets and the growing popularity of soccer in the U.S., Barcelona opened a commercial office in New York that will lead the team’s efforts to expand its business, gain more fans across and help the sport grow in the U.S.
U.S. firm Liberty Media buys F1: Formula One is being bought by Liberty Media, a U.S. company that invests in entertainment and sports, for $4.4 billion. Liberty Media Corp., which is controlled by 75-year-old tycoon John Malone, has ended years of uncertainty about the ownership of the auto racing series with Wednesday’s deal. Published: Sept. 7, 2016, 7:55 p.m.